1. The universe is constantly expanding (or “stretching”) into the space it creates it for itself (or that we just can’t answer what it’s expanding into). 2. It is possible that there are multiple dimensions that we cannot detect-and the nature of these dimensions is unknowable (though presumably anything goes). But for me, the truly humbling thing about astronomy is how its scale and magnitude of energy transferals that occur make us (and our problems) seem infinitesimal. 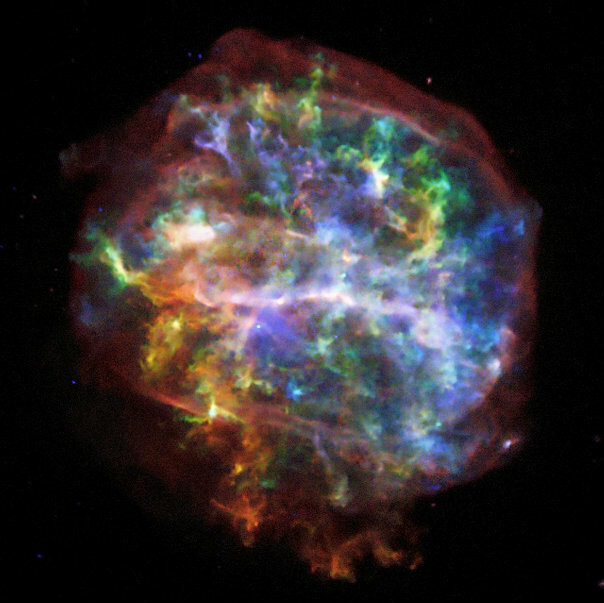 The following photo from Hubble showing a supernova is not only beautiful, but haunting when you realize our entire solar system can easily fit inside the expanding cloud of debris 13 times over! Of course, all things are relative (right Einstein?) so our problems (car payments, spilled milk, even global warming) are salient and seemingly large because our focus in on our little sphere and how these things directly affect us. This only makes sense as we try to control our environment and consequently try to establish some sort of control over our lives. (I mean, what do we really care about a star that went supernova billions of years ago? It ain’t gonna put food on my table!). But I have found that the occasional perusal of explosions and distances that boggle the mind put my ego and my problems in perspective (at least until I get caught up again in my day-to-day concerns). But for those brief moments of clarity, the cosmos can remind me to let go of the often trivial things that incite my self-righteous rants and ulcer-inducing stress. And isn’t that worth a look into the night sky?